Give TiVo points for continuing to improve its service for subscribers, and while you’re at it throw in a clove cigarette or two. TiVo has struck a deal with Jaman, the peer-to-peer Web movie service, to bring its catalogue of American indie and international films directly to its set-top box. Think Oscar-nominated “Paheli”, “Loverboy” (Sundance), “All About Lily Chou-Chou” (Berlin International Film Festival), and “La Promesse” (Cannes) — movies that you’d have a hard time finding anywhere else. Ah, subtitled films. Rentals start at $1.99 but some movies and shorts will be available for free. TiVo expands Jaman’s reach to set-top boxes; it already is available for PCs, Macs, SanDisk’s TakeTV, and DivX. It’s a good partnership for TiVo. Jaman supplements the mainly Hollywood fare TiVo gets from its relationship with Amazon Unbox, so movie fans get the best of the indie and mainstream film worlds. It’s not a game-changing partnership, but it does allow TiVo to compete against Apple’s new iTunes rental service (with content from all the leading film studios) and updated set-top box, AppleTV Take Two. Ironically, Jaman originally hacked the first AppleTV. It remains a shame that the AppleTV still remains under the lock and key of Apple. It’d be great for AppleTV owners to have access to third party developers and Web services such as Jaman. 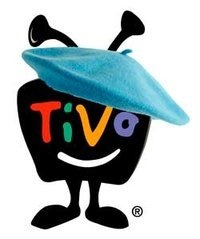 Funny illustration credit of TiVo wearing a French beret goes to: Gizmodo.